For correlations to the Next Generation Science Standards, visit the Extras page for this book. The well-written, reader-friendly book, Picture Perfect Science Lessons: Using Children’s Books to Guide Inquiry, 3-6, is intended for any upper elementary science teacher, 3rd-6th grade, who is looking to enhance a current curriculum. With the assistance of the 20 strong, inquiry-based lessons presented in this book, any science teacher can create an atmosphere for learning that is student-centered and accessible to all learners. All expertly-designed lesson and objectives used in the book align with the National Science Education Standards. The purpose for this book is for readers to have access to a wide range of fiction and nonfiction picture books that can be used during science instruction in order to promote the science inquiry process. Picture books are used as the basis for this book due to the fact that they significantly enhance learning. “Picture books, both fiction and nonfiction, are more likely to hold our attention and engage us than reading dry, formulaic text … Engagement leads to remembering what is read, acquiring knowledge and enhancing understanding” (Harvey & Goudvis, 2000). Furthermore, each lesson plan also includes reading strategies to use in order to support students as they learn to read and read to learn. As mentioned previously, the content in this book reflects many of the National Science Education Standards. The lessons were created in order to guide the inquiry process and utilize the 5 E’s Instructional Model. This Model allows students to engage, explore, explain, elaborate and evaluate. Each lesson explicitly states how the teacher will guide students through each of the 5 E’s. Some of the lesson topics presented in this book include: ocean life, Earth and space, pollution, sound, life cycles, simple machines, etc. The book begins with five introduction chapters which educate the reader about the topics presented in the book, and provide an explanation for why inquiry-based learning through picture books is important. Following these five chapters, the remaining chapters in this book are each dedicated to one specific lesson. Since each of the lessons is divided into its own chapter, the reader is able to navigate the book very easily. In addition, all lessons are written in the same format which makes the book inviting and practical. Each lesson begins with a brief lesson description, suggested grade level, and lesson objectives. Following this is information describing the picture books that will be used during the lesson. Each lesson also includes a list of materials, printable student journal pages and graphic organizers, as well as, a quiz/assessment. This book is a fantastic purchase, and I would highly recommend it to any elementary science teacher. I do this because I believe that any elementary science teacher would benefit from reading this book. Picture-Perfect Science Lessons: Using Children’s Books to Guide Inquiry, 3-6 is full of valuable information and lessons for teaching science in grades 3-6. In addition, the book has a ton of high-quality printable resources that eliminate the stress on teachers to gather/create it all. Overall, this book does a terrific job supporting educators in their journey to promote inquiry-based learning through picture books and hands-on experiences. 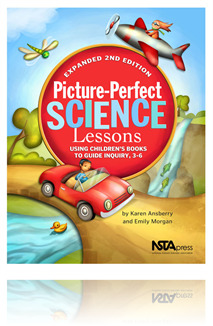 This set includes Picture-Perfect Science Lessons, Expanded 2nd Edition and the Picture-Perfect, Expanded 2nd Edition Science Book Collection. This set equips the teacher with the lesson book plus more than two dozen hardcover and softcover picture books referenced in the individual lessons. All the books fit inside a zippered canvas tote bag with a screened image of the book cover on it. This bundled set is a great value--especially compared to the retail cost (and effort) of buying the books separately. All that said, the book Down the Drain: Conserving Water (You Can Save The Planet) is no longer available in quantity from any reliable source. As a result, the total price of the Collection has been reduced to reflect this omission. We regret any inconvenience.